Taxpayers must be extra careful while filing Income Tax Returns as a small mistake can bring them into the attention of the Income Tax Department. And as obvious nobody would ever want this to happen. 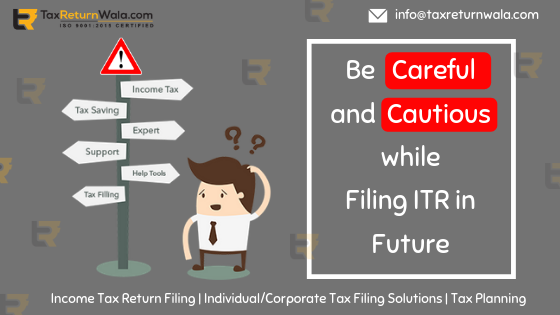 So to be very cautious, the Income Tax Department has decided to introduce some measures which can be helpful in performing additional checks to prevent any outgo towards ill-considered investment claims made by the individuals while filing their tax returns. Recently, it has been noticed by the Central Board of Direct Taxes (CBDT) that many people are furnishing erroneous investment claims under Section 80(C) of the Income Tax Act, whereas a person can claim tax deductions only up to the tune of Rs 1.5 lakh under the section. The department has now set up a three-membered committee to deal with issues related to such situations where unjustifiable tax demands have been flagged by a tax officer.And hence after judging the current scenario, it is being suggested to the taxpayer to pay the taxes honestly instead of availing exemption by opting fraudulent means. Taxpayers must properly fill all personal details such as name, address, date of birth, mobile number, email etc. and cross check them with the Permanent Account Number (PAN). The bank details should be mentioned accurately along with the IFSC (Indian Financial System Code which will make ITR processing more smoother. Mention the investment details i.e. the interest earned from fixed deposits (FDs), recurring deposits (RDs), Mutual Fund Investments or any other infrastructure bonds. If a salaried employee has switched his/her job during the financial year, then the earning from previous job shall also have to be reported along with the current job income. Coming back to the point , the department has conducted investigations in Mumbai, Bangalore and Punjab which revealed that some fraudulent individuals were encouraging taxpayers to claim refunds based on fabricated investments under Section 80(C) towards housing loans. Henceforth, filing of ITRs needs to be done cautiously and carefully in order to prevent communications from the Income Tax Department.